The geology of Florida does not present the conditions needed for gold. Most of the state of Florida as we know it today was once covered by water, where limestone deposits were formed and built up over millions of years. Numerous occurrences of flooding and receding ocean waters added sediment deposits as well. Simply put, these are not the geological conditions where gold is found, and there are no known occurrences of natural gold within the state of Florida. 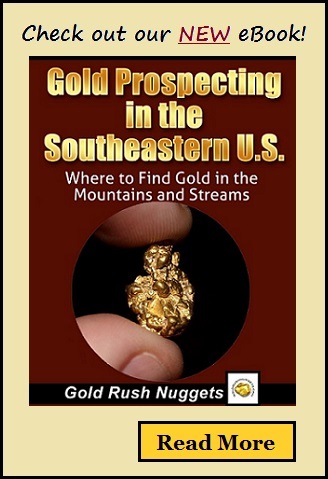 Gold prospectors in Florida would be encouraged to research the gold deposits that have been found in nearby Alabama and Georgia. Both of these states have produced significant amounts of both lode and placer gold, and recreational mining is still done in several areas within both states. Although panning for gold in Florida might be a fun way to pass the time, it is doubtful that any gold is likely to be recovered. Focus attention to the gold bearing states to the north if you are serious about finding gold. Florida may be a poor state when it comes to gold prospecting opportunities, but there are many other ways to locate gold in the state. Florida has a wonderful rich history relating to Spanish explorers, buried treasure, and ship wrecks in the Gulf of Mexico. Any gold prospector in Florida would be well advised to put away the gold pan and get out the metal detector, as Florida’s gold come in the form of ancient gold and silver coins, and other historic relics. Additionally, there are miles and miles of beaches littered with lost rings, watches, and other modern valuables. There are probably thousands of ounces of gold waiting to be found that are buried in the sand. The gold in Florida may not be in the form of gold dust, flakes, and nuggets like you would hope for, but you still can’t complain! In fact, Florida may be one of the poorest states to pan for gold, but when it comes to treasure hunting for gold coins, rings, necklaces and watches, it could probably be considered one of the best. I don’t know about you, but I’m happy with any gold that I find, in whatever form it comes in! Florida may not have any known gold occurrences, but many other states in the Southeast are LOADED with gold! Our new eBook tells you where it can be found!